The 4th of July is here and we know what that means. Fireworks! That's right. Before you know it, you'll be setting up your lawn chair in your favorite spot, with your neck craned up towards the sky. And then the starry night will be illuminated with fantastic explosions, courtesy of some heavy duty black powder packed shells. But the 4th also means something else. Beer! Cold beers are sure to rule the afternoon and evening of the 4th, which means you're going to want to have plenty of them handy. So. You need the perfect accessory. 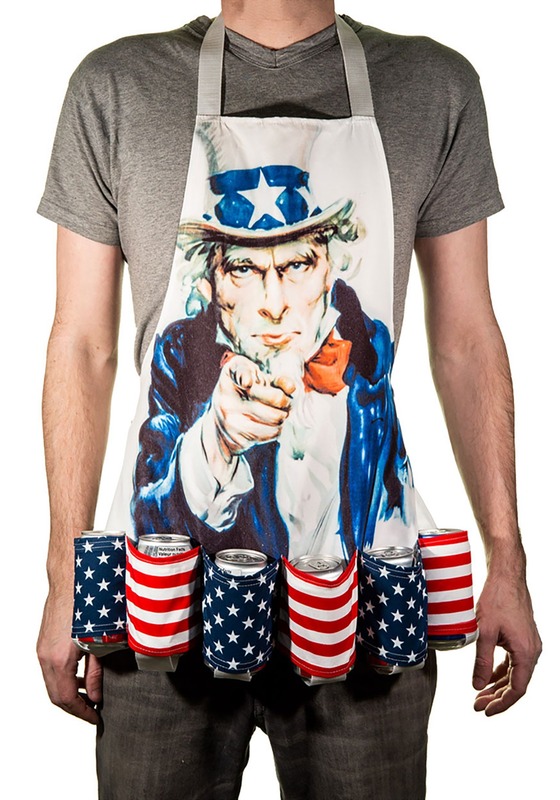 You need this Uncle Sam Fourth of July Beer Belt Apron! This Beer Belt Apron does indeed feature a patriotic design with Uncle Sam on the front, and each beer can pocket features stars or stripes. Totally patriotic, we're thinking that using this apron on the 4th will be the ultimate ode to America. You can keep some cold brews handy while you cook on the grill, and just keep it on when you retire to your chair to watch the fireworks. And you'll have those beers handy the whole time! So, about the beer! You might enjoy a light lager or even a hefty double IPA, but as long as you've got them in cans, you'll want to keep them handy. And you can do so in this Uncle Sam Fourth of July Beer Belt Apron! Shop our entire selection of 4th of July accessories to see the best ways to infuse costume fun into your Fourth!